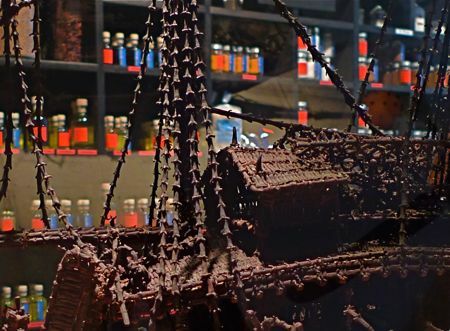 The centerpiece of Olivier Roellinger’s Paris shop: A ship constructed of dried cloves. Similiar models are made in the Moluccas, where clove trees were once so abundant that sailors could smell their fragrance many miles out to sea. Stepping onto the bare planked floor, I felt, for a split second, that I had time-traveled to an old seafarer’s provisioning shop. Then I saw it: A sailing ship constructed entirely of clous de girofle—that is to say, cloves—from tip-tilted stem to stern. 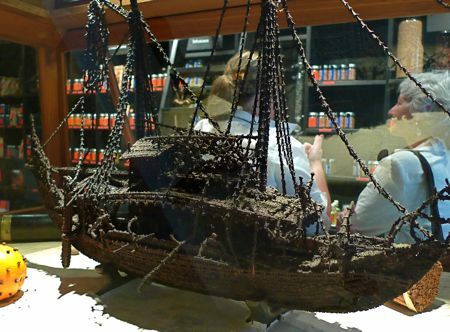 Thousands of dried buds had been used to create the masts and rigging, the wheelhouse and the bridge, even sailors leaning over the side, and had the ship not been displayed in a glass museum case, its aroma would have been intoxicating. 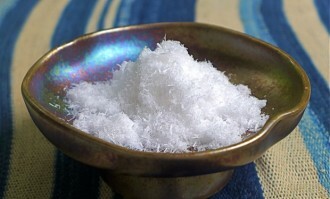 Tuesday morning, 10:26 AM: I had just walked into Epices Roellinger on rue St. Anne not far from the Opera. But I felt as if I had passed through a portal into another world—the world of Olivier Roellinger, a three-star Michelin chef whose passion for spices and the seafaring life is everywhere to be seen in this stunning new boutique. 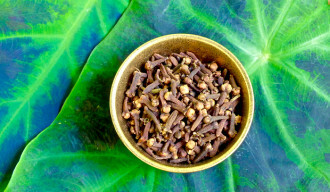 Juxtaposed with ephemera from the days when France was a colonial power are the real stars of the show: rare spices hand selected by the chef from India, Madagascar and other locales, and the exotic blends he conjures up in his atelier. At the sniffing bar, enormous jars of rare peppercorns beckoned. 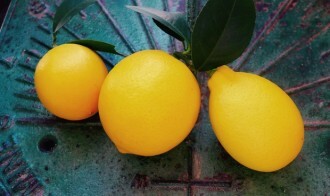 I lifted a glass stopper and inhaled the fragrance of Karimunda: It was bright and vivid, with overtones of ripe tropical fruit, mango and apricot, scents I’ve never before smelled in peppercorns. On the label the chef advises us to use this extraordinary pepper grown in Kerala to season fromage blanc as well as scallops and white-fleshed fish. The vendeuse cast a speculative eye in my direction, but kept on with her paperwork. I went a little crazy as I lifted one stopper after another, inhaling deeply. My basket filled up with jars of Neelamundi ( rare, floral and vegetal aromas, for creamy vegetable soups), Jeerakarimundi (almonds and pine resin, very sharp, for pates, potatoes and fowl), Panniyoor (rich, woody aroma, for red meats and lamb). 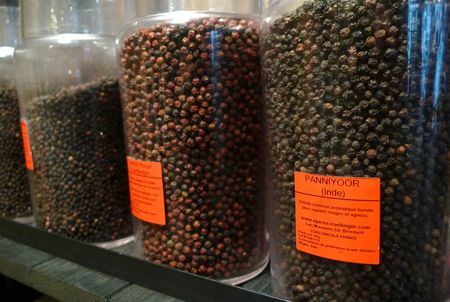 And I pounced on jars of hard-to-find red peppercorns—the real thing, not the faux pink baies roses often found in peppercorn blends—from Malabar and Cambodia. I was so mesmerized that I almost missed a second sniffing bar further along the ebonized wall of spices. (With their bright red-orange and blue labels, the jars glow like unearthly jewels in dark velvet boxes.) Here were Roellinger’s famous blends, labeled with evocative names that might set even the most earthbound cook to dreaming. 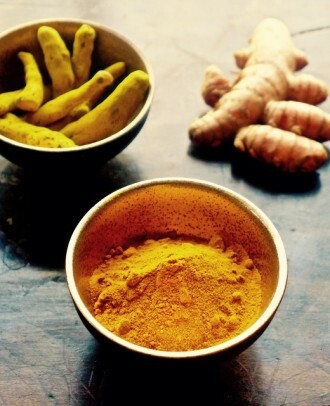 Retour des Indes (Return to the Indies) is the most popular: a bright, coolly aromatic curry made of turmeric, coriander, star anise, mace, Sichuan peppercorns and other spices that was the chef’s first significant blend, an homage of sorts to Mahe de la Bourdonnais, an 18 century governor of the islands of Reunion and Maurice, using spices brought to St. Malo on the coast of Brittany by the French Compagnie des Indes. The trajectory of Roellinger’s life has been dramatic. A native of Brittany with a deep passion for the region’s seafaring history, he was on track to be a chemist when he was badly beaten one night in a Clockwork Orange-style attack and left for dead. During a long, slow recuperation, he decided to change his life and become a chef. 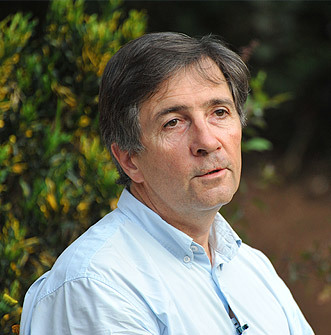 Eventually he opened Les Maisons de Bricourt, a restaurant and inn in his family home in quiet fishing village of Cancale. He became known for his contemporary style of cooking, his food, as The New York Times wrote, “an interplay of the familiar and the exotic,” exemplified by St. Pierre Retour des Indes–John Dory in a sauce imbued with Indian spices–the dish which put him on the map. 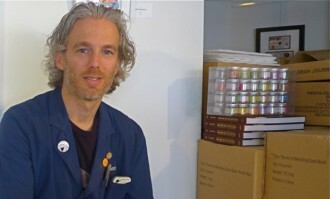 Shortly after Michelin awarded La Maison de Bricourt its third star in 2008, Roellinger decided to shutter it for health reasons. He dove full time into his other obsession: spices. 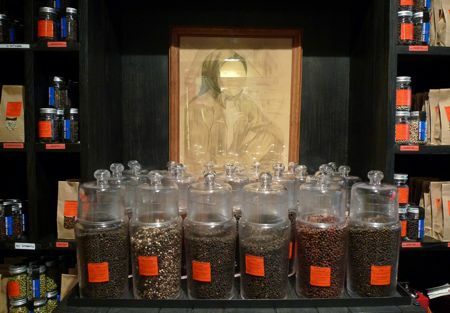 On The Maisons de Bricourt website, you can see the wizard at work in his atelier, grinding spices and experimenting with new mixtures for his shops, or as prefers to call them, entrepots, or warehouses. (There are two more, one in St. Malo and one in Cancale.) 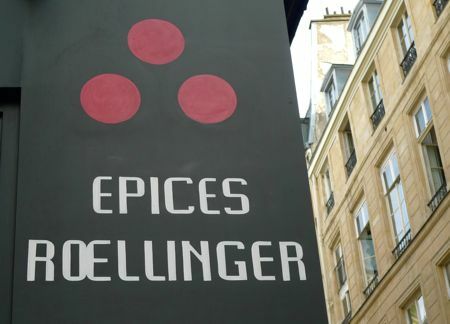 And you can read more about the travels and inspirations that shaped his life and career at Epices Roellinger, as well as view the many spices, blends and other products that are for sale in his shop. There are recipes for every blend, incidentally, which is helpful if you’re having trouble visualizing how you might use them. Et moi? I was so taken with Roellinger’s vision that I could scarcely lift my groaning shopping bags. Not only did I succumb to the peppercorns and blends such as Reve de Cochin and Poudre Equinoxiale, but also to Trois Etoiles de Mer, a dvd about his travels through the Indian Ocean, Voyage aux Pays des Merveilles, a beautiful cookbook with recipes using spices such as vanilla and saffron, and an elegant spoon for measuring spices. 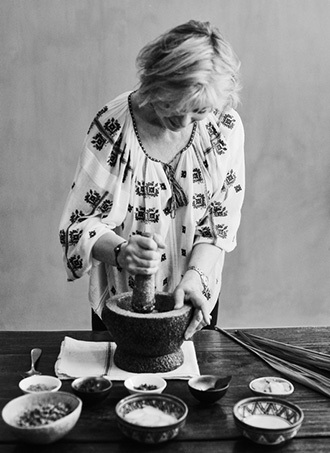 Left behind, alas, was the billot-mortier, a handsome black marble mortar and pestle set into a heavy wooden block, almost identical to the one Roellinger himself uses. At 5.1 kg, it was not going to pass muster with the hauler of the baggage. But I consoled myself with a tin of caramels au beurre sale, possibly the most delicious salted butter caramels I’ve ever tasted. Luckily more are available, just a click away.